Sculptors create unique works of art in a three-dimensional form for beauty rather than functionality as its primary purpose. Though some sculptors are employed by organizations, most are self-employed, requiring a self-starting attitude, handling networking, sales and marketing issues, and time management skills. Maintaining a studio as a safe environment is also important, with sufficient ventilation or air filtration, cleaning up spills and dust and other issues. Important qualities to nurture include creativity, artistic ability, manual dexterity, interpersonal and communication skills, customer service skills and sales and marketing abilities. A bachelor’s or master’s degree in fine arts will give you an excellent base from which to start a career. Educational opportunities will give you a chance to work with a large range of materials, learn basic design concepts and art history. It’s also an excellent time to get feedback from professional artists and start building your portfolio, a sampling of your work to show prospective clients. Self-employed sculptors will find business, marketing and accounting classes helpful in managing the business side of the art. There are over 300 programs currently accredited by the National Association of Schools of Art and Design. You’ve got your degree; now what? Remember that portfolio you made during your education? Now is the time to put it into action. Attend classes, workshops and utilize private instruction opportunities from more advanced sculptors. Make connections with local galleries and arts councils. Have a love for history and old things? Archivists care for antique documents and provide research into historical facts. Art directors bring together all the diverse elements of a production into one cohesive unit. Curators, museum technicians and conservators create and maintain exhibits and restore historical items prior to displaying them. Does the drape and flow of clothing fascinate you? Fashion designers sketch out designs, choose fabrics and trims to execute them in and write up special instructions for assembly. Maybe your interest is in virtual sculpting. Graphic designers produce unique visual concepts that communicate ideas or information. Want to make functional sculpture? Industrial designers plot and configure concepts for manufactured goods. Jewelers and precious stone and metal workers create small sculptures in the form of cast and wrought metalworking and specialty stone carving. How about working on some out-of-this-world sculptures? Multimedia artists and animators create models and visual effects for video use. Photographers use their technical skills, composition and design knowledge and creativity to set up exceptional still images. Self-enrichment teachers educate the general public on a range of topics, usually as continuing educational courses. 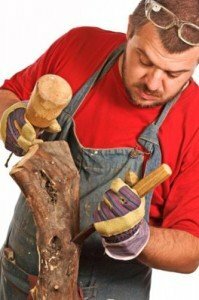 Woodworkers create a number of different artistic pieces, depending on their specialty, out of wood. Sculptors were receiving an average hourly rate of $21.56 based on figures from May 2010. Self-employed sculptors often see a wide range in pay rates based on skill level and market. Many sculptors work part time, with an additional income to supplement their artwork. It is anticipated that sculptors will see an 8% rise in opportunities in the next decade, slightly slower than the average of all careers. Competition is expected to remain strong in this path, with competition for grants and gallery showings remaining intense. Sculptors, like all artists, will experience a shift in income based on the economy, doing well when it is booming and fair when it is not.